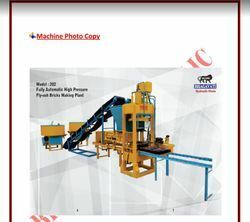 Providing you the best range of fully automatic fly ash bricks and block making machine, fully automatic tracker interlocking block plant, automatic concrete brick making and fully automatic tracker interlocking block making machine with effective & timely delivery. Brick Raw Material Concrete crush 33%,fly ash 60%,cement 7% & Water. 1. Heavy duty M.S. fabricated stationary chassis of angles, channels and sheet fitted with hydraulic jacks for compression of 100 tons hydraulically operated power pack with a 7.5.hp AC motor, sweep, Oil cooling system, and plate vibrating system, hardened molds to release 4 bricks in one stroke having dimensions of 225mmx100mmx75mm. Cycle period 22-26 seconds to give output of minimum 4,000-5,000 bricks and blocks per shift of 8 hours. 2. PAN MIXER 5 FIT 1PC. Of 1500mm diameter fabricated with structural mild steel with replaceable inner lining fitted with 7.5hp motor, oil filled reduction gear box for feeding hoper with a capacity to mix 350kg.Of raw-material. 3. BELT CONVEYOR to shift mixed activated raw-material from pan mixer to the feeder bin of the press. The ply rated 15 running feet rubber conveyor beltis mounted on structural M.S. frame fitted with a 2hp motor, ample rollers and speed reduction pulleys with dust covered bearings for long and maintenance free smooth run. 4. PALLET TRUCK (TROLLEY) to load, measure, lift and shift raw material from stocks to the pan mixer can also be used to lift and shift pallets for curing. Thisis a manually operated on structural mild steel chassis with tayers. 1. Heavy duty M.S. fabricated stationary chassis of angles, channels and sheetfitted with hydraulic jacks for compression of 125 tons hydraulically operated power pack with a 10.hp AC motor, sweep, Oil cooling system, and platevibrating system. Cycle period 20-25 seconds to give output of minimum 8,000-10,500 bricks per shift of 8 hours. 2. PAN MIXER 5 FIT 2PC. Of 1500mm diameter fabricated with structural mildsteel with replaceable inner lining fitted with 7.5hp motor, oil filled reduction gear box for feeding hoper with a capacity to mix 400kg.Of raw-material. 3. BELT CONVEYOR: to shift mixed activated raw-material from pan mixer tothe feeder bin of the press. The ply rated 18 running feet rubber conveyor beltis mounted on structural M.S. frame fitted with a 2hp motor, ample rollers and speed reduction pulleys with dust covered bearings for long and maintenancefree smooth run. 4. PALLET TRUCK to load, measure, lift and shift raw material from stocks tothe pan mixer can also be used to lift and shift pallets for curing. This is amanually operated on structural mild steel chassis with tayers. 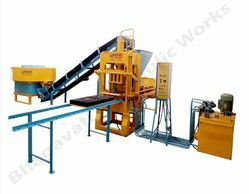 We are offering Automatic Concrete Brick Making Plant. 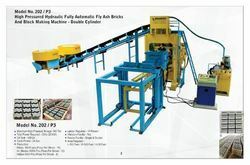 Looking for Bricks Making Plant ?